Prancer, this adorable Dreamy Eyes stuffed pony, is ready for hours of fun and adventure along with lots of cuddling and snuggling. 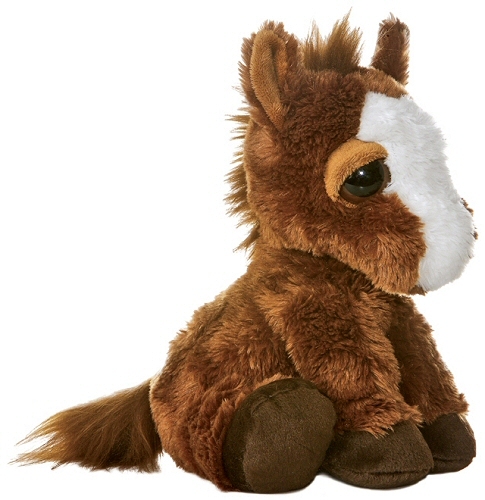 Plush Prancer Pony has soft brown fur, dark brown hooves, fluffy brown mane and tail, and big sleepy brown eyes in an oh-so-sweet face. Standing, sitting, or just flopping down, there's no need to worry about what to feed this stuffed pony... this plush pony's huggable tummy feeds only on love. It's a ride in the park to create a horse lover's paradise in your children's rooms with this Horseland peel and stick border.